Sitting on the side of the road next to my bike, holding my scraped and bloody knee. This is a scene that has been etched in my memory. Not because of one isolated incident, but due to how many stinkin’ times I ‘biffed it’ trying to do something impressive (stupid) on my bike. Remember when you were 7…8…9 years old? 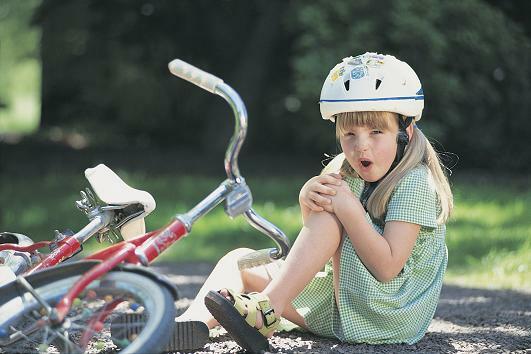 Did you ever skin your knee or elbow on the pavement? It only takes a moment thinking about it to vividly remember the pain and emotions of the moment. I’m not sure why this is one experience that just happens to be almost a ‘right of passage’ through childhood. But it is….not for all of us, but for most. Recently, I received my Ordination (transferred from previous church) as a Minister in the Free Methodist Church. Sure, I’ll now be able to officiate weddings and funerals in GA. But this is a mile-marker much bigger for me. The reason? I’ve skinned my knee on the pavement of ‘church hurts’ too many times to count over the last 22 years. My Pastor even suggested that I was suffering from a form of PTSD during one of our early talks! When my family moved to GA 3 years ago, my wife took a Children’s Ministry position in our current church. At that point, I pretty much saw myself lying on the scolding hot pavement, holding my skinned knee, and determined I’d never ride ‘that bike’ again! I had not lost my faith in God…..just my faith in the Church! Now that God has brought me out of that pity-party of suffering, I realize that last statement was ridiculous! We can’t have a relationship with Jesus and reject the Church…His bride. It simply doesn’t work! I’m incredibly blessed to be serving again on staff at a church. Now, I realize that I may scrape my knee again in the future. I’m OK with that now….really. In this passage, Jesus is specifically talking to his disciples about the impending troubles they were about to endure following his death. But for me, it has taken on a very specific encouragement. Here’s my paraphrase as it relates to the topic. While doing ministry work you will have many seasons of pain, dysfunction, and sadness. But never forget, I have power over these things. Stay the course. Let me share my definition(s) of church with you. church – simply a community of believers learning how to do life and faith together. We all vary in maturity, hurtful experiences, and resilience to life. Church – the holy, pure ‘bride-to-be’ of Christ. That said, my past wounds have been caused by the church & some of my own doing. Hear me loud and clear on this. We have not be attacked, hurt, defiled by the Church! Can I share my conclusions with you? – Kingdom work is messy. Accept it and dive into it! – God’s call to partner with Him is greater than the speed-bumps we will come against along the way. – Our rewards are in Heaven. We will experience few (if any) while here on Earth. It’s not about the benefits. – No matter how bad, painful, or ridiculous our negative experiences in church work have been (will be) …..Jesus’ physical ministry experience was worse! If you find yourself lying on the side of the road reading this blog, I pray you find encouragement. The numerous miles of riding down the road with the wind flowing through your hair should not be completely taken away from you due to a handful of scrapes and bruises. May you find healing, joy, and purpose in all that God has planned for you. How have you moved forward in ministry work? Join the conversation below. Brent, great post. There are many church leaders who are hurt and reeling from the pain they’ve experienced from hurts. There was a time I thought I wouldn’t go back to church because of a rough spot. And now there are days where it’s frustrating to see our students not getting it and doing stupid stuff. It hurts and it stings. It makes me not want to go back. But then I remember little things. Like the former student who sent a Facebook message saying how much our work had meant to her. Or the student who picked me out of a crowd of a thousand people to come say hi after not seeing us for many years. I move forward in ministry work by remembering those special moments when people have revealed what our work has meant to them.